Does anyone know of a good wheel builder in south midlands area (anywhere from Birmingham to Oxford) I want someone who is experienced with lacing Rohloff. I previously heard good reports of Ross Spiers near Oxford, however he has now retired. So if anyone has any other recommendations I would be grateful. SJS are in Somerset, it's just too far for me. I suppose I could mess about with sending the hubs via post and get them shipped back to me, but it's going to take a while and be quite expensive with insuring the Rohloff etc. I think I would prefer to find someone more local who has experience with lacing Rohloff hubs. tommydog wrote: SJS are in Somerset, it's just too far for me. If you've got a spare day, a train is probably cheaper than the insurance, last time I went it was around £40 return from Derby, though it was a full day. If your hub doesn't have them already, Rohloff are recommending the fitting of support rings to all hubs, these come in two types, the better of which can only be fitted by Rohloff service centres. For detailed explanations, have a search on the Thorn forum. Ehhh????? ........... Support rings! That's news to me and SJS as I just recently bought a Rohloff hub from them with a wheel build. Definitely no use of 'support rings' on my hub. tommydog wrote: SJS are in Somerset, it's just too far for me. I suppose I could mess about with sending the hubs via post and get them shipped back to me, but it's going to take a while and be quite expensive with insuring the Rohloff etc. I think I would prefer to find someone more local who has experience with lacing Rohloff hubs. SJS wheel builder apparently builds about 3 Rohloff based wheels a day. I think some other wheel builders might be lucky to build 3 in a year! A Rohloff wheel needs to be built properly with Sapim spokes supplied by Rohloff as they have the correct crucial head shape to fit into the hub flange and head length of 2.9mm to avoid flange failure. If it were me I would get my hub to them to build my wheel. A 32H spoke Rohloff wheel build is only £45 and shipping the Rohloff hub to them is not going to be that expensive. Their return shipping cost to you is a flat rate £5 which I paid for mine plus other items I bought at the same time which I think they sent Parcel Force 24 or may have been PF48. Sorry can't remember. The wheel was very well packaged. You will be impressed. Ivor Tingting wrote: shipping the Rohloff hub to them is not going to be that expensive. Account holders like SJS either use their preferential rates or accept the risk and post uninsured. Yes exactly this, which is why I suggested them. Better to find an expert you can have a call with than an infrequent builder you can visit in my book. PH wrote: If you've got a spare day, a train is probably cheaper than the insurance, last time I went it was around £40 return from Derby, though it was a full day. The spoke flange of a hub is subject to enormous loads. These loads can shorten the lifespan of a hub if the wheel is not correctly maintained or built to the correct specifications. Our Flange Support Rings should be fitted to each hub flange prior to lacing the wheel, to ensure prolonged SPEEDHUB enjoyment. Flange Support Rings are supplied as standard in every SPEEDHUB kit produced as of Fall 2017 and must be fitted to all older SPEEDHUB units when the wheel is next re-laced. 1. 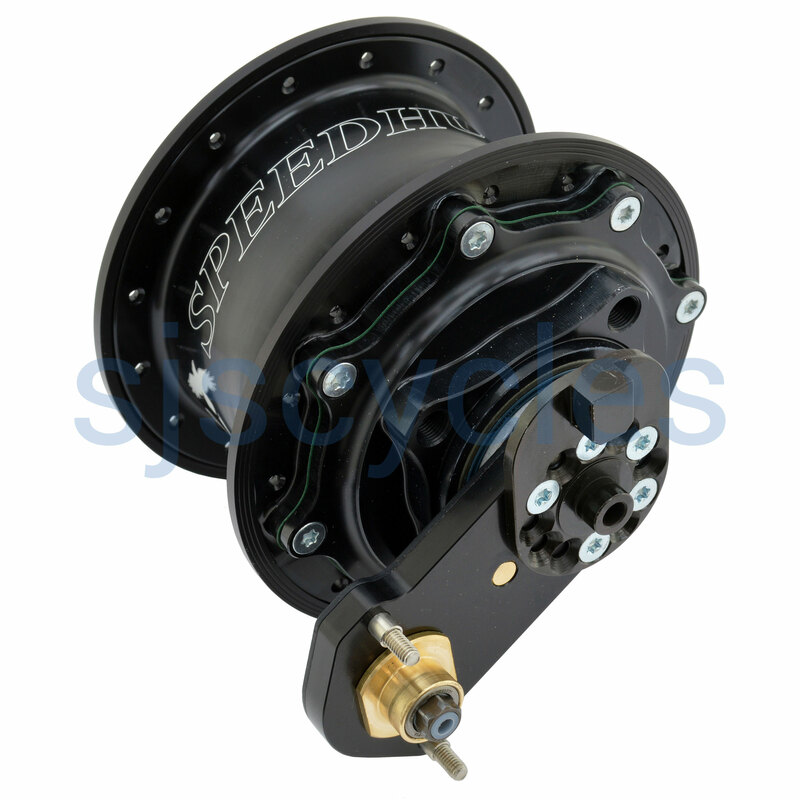 Article number 8524 - for all SPEEDHUB units, where the text „Made in Germany“ is underlined. 2. Article number 8523 - for all SPEEDHUB units, where the text „Made in Germany“ is NOT underlined. It might be better to actually read what you are copying and pasting. The advice appears to apply to OLDER Speedhubs. Neither of my 2 Rohloff Speedhubs have been supplied with these rings and none have been fitted when the wheels have been built and the hubs are just fine. Do you actually own a Rohloff hub or are you just scaremongering? Last edited by Ivor Tingting on 17 Apr 2019, 11:57am, edited 2 times in total. SJS sent mine by Parcel Force 24.
as of autumn 2017 all new Rohloffs are supplied with flange support rings. They don't stop the flanges from breaking, but they do hold the wheel together in the event that the flange cracks. If you have any Rohloff hub which was supplied without the support rings, you can upgrade to the current specification by installing them before the wheel is built. If you plan on using the hubs under high loads, in far-away places or anywhere it might be very inconvenient for you if the hub cracks, it is a good precaution to have the support rings fitted. They only cost £25 for a pair; it is pretty much a no-brainer if you are rebuilding the wheel anyway (and it is what have rohloff stipulated for at least two years now) but I'd suggest that you rebuild the wheel with the rings if any of the above conditions apply; it isn't that big a job, since only half the spokes have to be undone (a quarter at a time if needs be), and they can even stay in the hub whilst the support ring is fitted. It is likely to be less than an hour's work for someone who knows what they are doing. this is a current hub with the #8524 flange supports fitted. IMHO anyone who had a hub built into a wheel without using the support rings in the last couple of years or so has either taken a conscious decision not to (for some reason) or has been badly advised (possibly by omission). Last edited by Brucey on 18 Apr 2019, 8:43am, edited 1 time in total. Brucey you have now got me worried I shall double check my hubs later. Looking at your picture of these rings around the flange, are Rohloff admitting to a design fault and this is their fix? Surely they should just make the flange taller so as not to need these rings or would this not address any weaknesses in the flange such as cracks? I guess fitting a separate outer ring means any cracks cannot spread to the separate ring so the flange is held together? If there is an inherent weakness in their hub then it should be subject to a recall and no cost to owners of them much like car manufacturers when they have to announce recalls because of design and safety issues. I would have thought a hub flange susceptible to cracking would be sufficiently serious for Rohloff to carry the costs of any adaptation to minimise this. As everyone knows the hubs aren't cheap. Don't worry too much Ivor, these hubs have proved to be very reliable. There have been cases of flange failure, but must be pretty uncommon.